Kenneth G. Blake’s “Autobiography Of A Little Jamaican Boy, Survival Of A Delicate Orchid Among Thorny Weeds” is the inspirational story of overcoming obstacles in life. Recent release “Autobiography Of A Little Jamaican Boy, Survival Of A Delicate Orchid Among Thorny Weeds” from Page Publishing author Kenneth G. Blake is both captivating and cultural; this work keeps the reader mesmerized through a journey of courage, challenge, faith and survival. 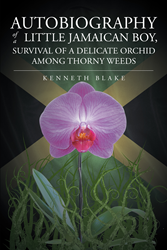 Kenneth G. Blake, a Christian, traveler, devoted writer and author has completed his new book “Autobiography Of A Little Jamaican Boy, Survival Of A Delicate Orchid Among Thorny Weeds”: a passionately crafted work that portrays the beauty of life and self-worth. Published by New York City-based Page Publishing, Kenneth G. Blake’s poignant tale is a heartfelt biography in which the main character lives through the audacities of a life in poverty. The story is about a premature child, who survived a primitive and hostile post slavery environment- and grew up in poverty with a single unemployed parent and four siblings. The prose, syntax and narrative of the book is uniquely island and it is colored with British and American cultural experiences. That is why the author has included personal details which have significantly influenced his life-and taught him lessons such as, how to grow and bloom in the [concrete] jungle of thorns: Irritating and choking circumstances! The book introduces the reader to historical accounts of the Author's country of origin: Jamaica West Indies. Then the book elaborates on the island's period of enslavement, bloody struggle for freedom, and subsequent birth of the nation. The reason some history and culture is included is to establish a background for the life story of the little Jamaican boy. His roller coaster life has exposed the boy (now man’s) strengths and weaknesses. Just when it seemed that he is on top, he then slides down a steep slope! And, up again! This has been the story of how his life has been. What should the reader take away from how the writer has lived his life? This Autobiography, tells the life story of a premature baby who had survived in rural Jamaica without available intensive postnatal care facilities. How? He was carried about, fastened to a pillow, with a caring and professional rural family doctor, and a loving young mother. The delicate little baby, like a beautiful orchid, grew up, and in time faced life's struggles. He struggled at play, school, work as an immigrant and as a soldier in the British Army, and especially in marriages. He has had many successes and as many failures. He has given honest accounts of his mistakes, remedial actions and recovery. The book is written to help those who face difficulties and are not able to think positively, or able to view problems as opportunities. It was written to show versatility, strength, determination, adaptability, and faith in the Almighty. These are the qualities that have allowed the writer to be happy and content. Blake hopes the reader takes all these qualities away from the reading. Readers who wish to experience this inspiring work can purchase“Autobiography Of A Little Jamaican Boy, Survival Of A Delicate Orchid Among Thorny Weeds” at bookstores everywhere, or online at the Apple iTunes store, Amazon, Google Play or Barnes and Noble.